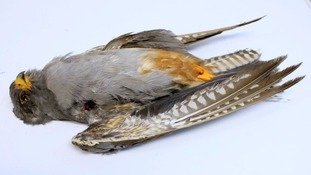 The RSPB is offering a £1,000 reward in appeal for information on shooting of rare red-footed falcon in the Cambridgeshire Fens. The protected bird of prey was found dead near Whittlesey last month. A post-mortem examination confirmed the bird, a young male, had been recently shot and that this was the cause of death. Cambridgeshire Police, the National Wildlife Crime Unit and the RSPB are appealing for anyone with information to come forward. The Bedfordshire-based wildlife charity is offering a reward of £1,000 for information about the shooting. "It’s awful that this rare bird has been needlessly and cowardly shot in the county. Red-footed falcons are rare visitors to the UK from the nearest breeding population in Eastern Europe, from where they migrate to Sub-Saharan Africa to spend the winter. They are listed as "Near Threatened” on the International Union for Conservation of Nature’s Red List of Endangered Species. RSPB experts have confirmed that the dead falcon is the same one that birdwatchers and nature lovers in the Midlands and East of England had delighted in seeing since it was first spotted in Stoke, Staffordshire in July.